The U.S. Senate has confirmed retired Gen. James Mattis as defense secretary.He will be a tremendous secretary of state and a great addition to President Donald Trump’s cabinet. Mattis is a Marine’s marine and a soldier’s soldier. He is exactly what our military needed. The Senate confirmed James N. Mattis as President Trump’s defense secretary Friday, breaking with decades of precedent by making a recently retired general the Pentagon’s top civilian leader. Mattis, 66, will lead the Defense Department’s 1.9 million active-duty service members and reservists and oversee a budget of more than $580 billion as Trump prepares to expand the military. He becomes the first senior military officer to serve as defense secretary since President Truman nominated Army Gen. George C. Marshall for the job in 1950, as the U.S. military struggled in the Korean War. Many lawmakers and long-time foreign policy observers hope Mattis can be a moderating voice of experience in an administration that has notably few senior officials with national security experience in Washington. UPDATE I: Retired Gen. James “Mad Dog” Mattis seen next to President Donald J. Trump at the Inauguration Day parade following his confirmation. UPDATE II: Retired Gen. James Mattis sworn in as Defense Secretary. WHY WE LOVE GENERAL MAD DOG MATTIS … THIS IS A MARINE’S MARINE!!! 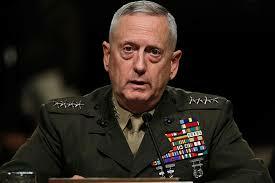 If there was ever an individual who should be secretary of Defense, it is Gen. James “Mad Dog” Mattis. Very rarely do we get to see an individual like this with the knowledge, the wisdom, the experience, the straight-forwardness and the love of the military in charge of the military. For all the things that have gone wrong with the military in the past 8 years, there is about to be a 180. Mattis knows exactly what the purpose of the military is, and its not to be a social experiment It is to protect and defend the United States of America from all enemies. When asked by lberal New York Senator Kirsten Gillibrand asked a gotcha ridiculous question as to whether LGBT and woman were undermining the American military, Mattis got the senator back on track and reminded everyone what the purpose of the US military is for … “We Have To Stay Focused On A Military That’s So Lethal”. This man is pure gold. Retired Marine General James “Mad Dog” Mattis is questioned during Senate confirmation hearing for the Trump appointed position of Secretary of Defense. Democratic Senator from New York, Kirsten Gillibrand asks for his thoughts regarding women and LGBT people serving in the military. General Mattis responds saying his main concern is the lethality of his combat force. Yesterday, at a post-election thank you tour stop in Cincinnati, Ohio, president-elect Donald Trump announced to the audience that he will be picking retired Marine Gen. James “Mad Dog” Mattis for Secretary of Defense. Mattis, 66, served more than four decades in the Marine Corps and as reported is known as one of the most influential military leaders of his generation, a strategic thinker who occasionally drew rebukes for his aggressive talk. Which makes him perfect to dismantle the PC nonsense that has spread to the military. Mattis is known for being a Marine’s marine. Even some on the Left were impressed by the selection. Rep. Adam Schiff (CA), the top Democrat on the House Intelligence Committee, praised President-elect Donald Trump’s nomination of retired Marine Corp General James “Mad Dog” Mattis. I guarantee there were cheers across out military both here and abroad when this was announced. This is one impressive individual. President-elect Donald Trump said Thursday he has chosen retired Marine Gen. James N. Mattis, who has said that responding to “political Islam” is the major security issue facing the United States, to be secretary of defense. Mattis, who retired as chief of U.S. Central Command in 2013, has often said that Washington lacks an overall strategy in the Middle East, opting to instead handle issues in an ineffective one-by-one manner.